I've forgotten where this info came from. Sorry! Edited by yours truly (contact me). The image came from Cartoon Party. Goku was a low class Saiyan that was sent to destroy Earth. His father, Bardock, was disappointed when his power level was only 2. When he was sent to Earth, he bumped his head and got a case of amnesia. He was pure hearted from then on. He was adopted by Grandpa Son Gohan, who was his first trainer. He accidentally killed his "grandfather" when he turned into an Oozaru (by looking into the moonlight). 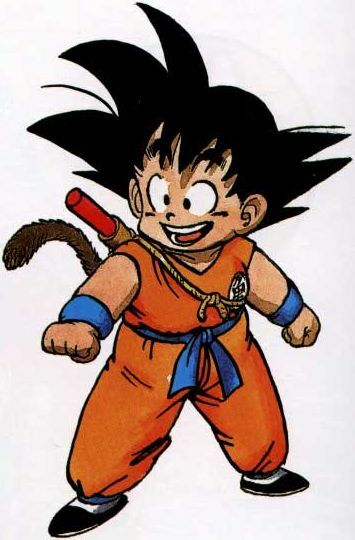 He was found by a young girl named Bulma when she went to search for seven mystic balls called the Dragonballs. He went looking for the Dragonballs when he and Bulma came across an old pervert called Kame Sennin. Kame Sennin was once the world's strongest man. After a while, Goku went back to Kame Sennin for training. He became super strong and was given an orange gi. 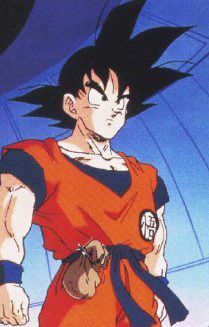 He wore this gi almost through Dragon Ball and Dragon Ball Z . In the beginning of Dragon Ball Z , we see his first son (named Gohan), which he had with his wife Chi-Chi. His brother Raditz was disappointed that Earth was still in existence, and he became furious when he figured out that Goku lost his memory of his past. That's when he went into the dead, meeting his next trainer, Kaiousama (King Kai). Kaiousama taught Goku two powerful techniques. The first one is the Kaio-ken, which doubles his speed, strength, and senses. The second is the deadliest attack in the entire series: the Genkidama (or Spirit Bomb). This attack nearly killed the Saiyan Prince Vegeta and the terrible lizard-like Frieza. It also killed the most powerful villain in Dragon Ball Z , Kid Buu. Other lesser known trainers were the cat Karinsama (Korin) and the god of the Earth named Kami. In Dragon Ball Z, Goku has 3 transformations. His first transformation is into a super saiyan. Goku first uses this form on episode 80, in the freeza saga. Then Goku transforms into a Super Saiyan 2 in his battle against Majin Vegeta. Lastly, Goku transforms into a Super Saiyan 3 in episode 230 in his battle against Majin Buu. 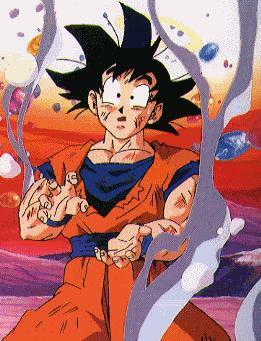 At the end of Dragon Ball Z , Goku became the most powerful being in the universe. The above description came from Kevin Tse, and was edited by yours truly (contact me). The image came from goku_upclose.tripod.com.